If you, a family member, or a friend is struggling with asthma, you might be familiar with a peak expiratory flow chart. 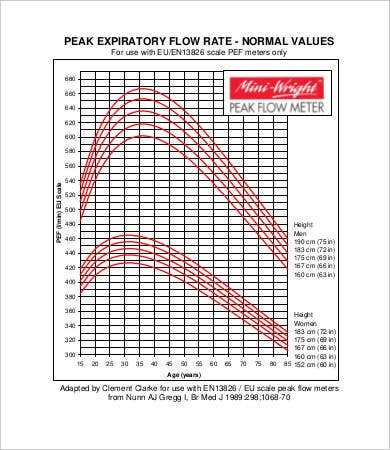 This chart measures how much constriction is going on in the air pipe based on how much the person can blow air into a peak flow meter after taking a deep breath. The number registered in the meter is then recorded on a chart. Over time, this chart will show you how much the airways are changing, whether they are improving or getting worse. You should be able to get these charts at your local clinic, or you can make your own. 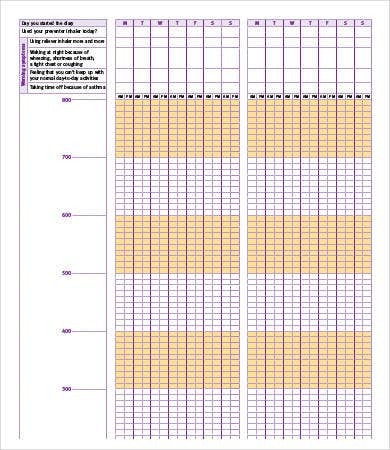 You can also save yourself the trouble and use these chart templates you can download as free PDFs. They come in different formats to make this task easier. How Does the Peak Flow Chart Work? A peak flow chart monitors an asthmatic condition by tracking the maximum flow (i.e., the peak rate) at which the patient can blow into a peak flow meter. The meter will record how hard and how fast the patient can exhale in a single go after deep inhalation. This peak flow number is recorded on a tracking chart. 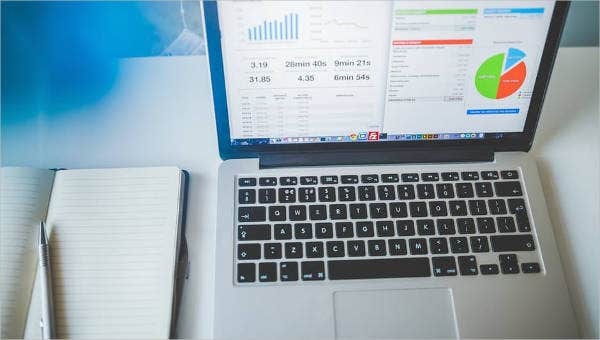 Some charts are designed to be used within a single day, and others track daily tests over a month or several months (short term vs. long-term monitoring). 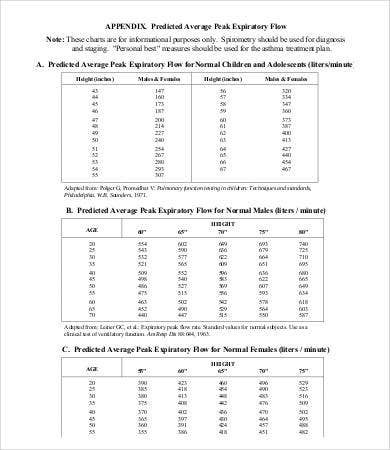 Over time these charts will be important for asthma treatment plans. The Printable Blank Peak Flow Chart is an easy way to get started. How Do I Use These Peak Flow Charts? 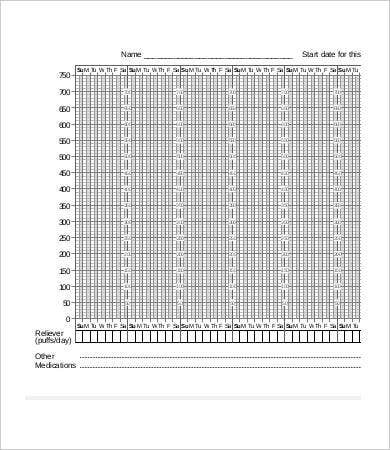 Parents and guardians of asthmatic children will want to have a peak flow tracking chart as well as a chart for the various flow rates for different genders at different ages and height. 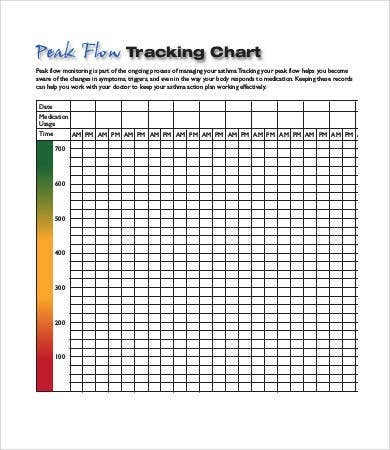 The free PDF tracking charts can be printed and displayed in a prominent part of the house to encourage routine checking. Tech-savvy parents can also try to create an Excel Chart Template for tracking purposes. 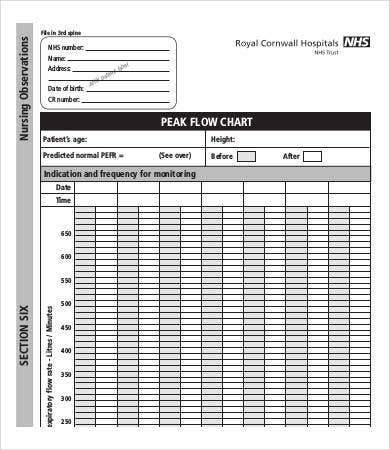 Along with the tracking chart, you will need to use a peak flow reference chart to determine the ideal peak flow number. Use the Pediatric Peak Flow Chart for this purpose. This can be used for a long time as a teenager grows into adulthood. 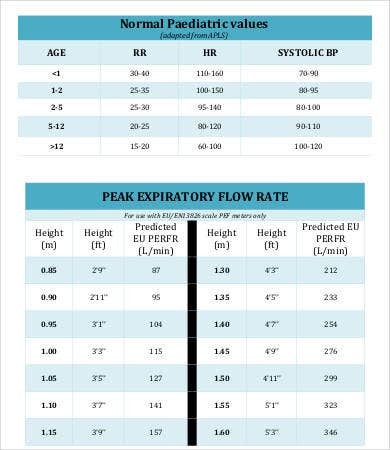 The Normal Peak Flow Chart allows you to identify the the flow rate for infants (<1 year old) and children (<12 years old), although monitoring isn’t usually recommended for infants and children younger than 12. 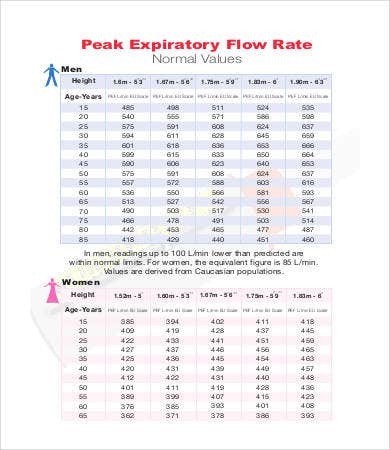 The Average Peak Flow Chart is great for all-round reference, showing the average peak flow for children and adolescents in one table, and separate tables for adult males and adult females. Regular use of the charts should help you learn to recognize the patient’s asthma pattern over time. Based on observation and chart readings, you can identify chances of a flare-up early on as well as identify asthma triggers. It might also be useful to have an emergency Flow Chart Template, which is very different from a peak flow chart. It is more of a Process Flow Chart to help your child learn what steps to take in case of an asthma attack when they’re alone at home or somewhere else.